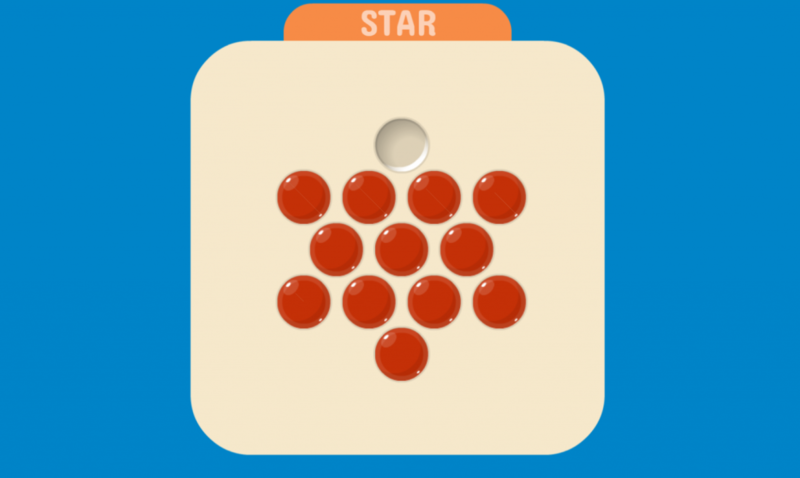 Welcome to a fun addictive Puzzle game on 123mathgames.org – Peg Solitaire game. This game gives you more than you think: entertainment, entertainment, a chance to kill your free time and relieve stress. In particular, this peg solitaire board game is much more complicated, so to get a high score from the first time is not easy, and players have the opportunity to transfer their achievements every day. With its high-quality interface and great sound, Peg board game is sure to give players a sense of relaxation and a better experience. It’s not hard to learn how to play, but it’s hard to beat every level. Try it and let us see Your achievements right now! Good luck and happy! You will understand why the peg solitaire board game on the chess board is irresistibly attractive. 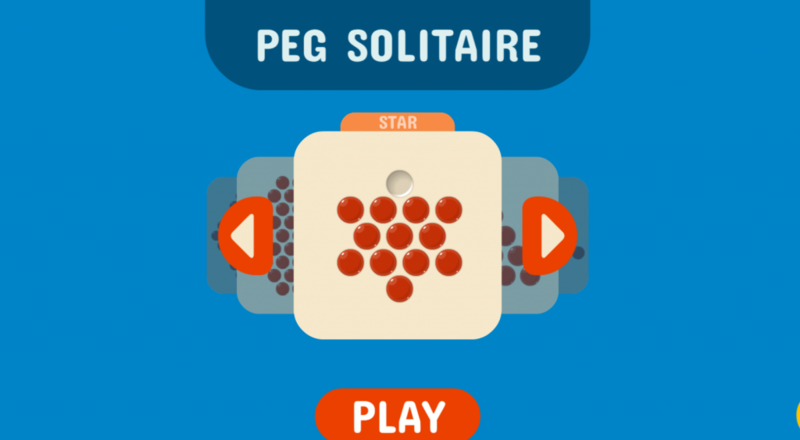 In Peg Solitaire, your goal is to remove the pegs until only one peg remains. You will be given a jumper with a large number of latches, while the holes in the center remain empty. You can click and drag the pin to jump over the horizontal or vertical pile on the side and move to the empty space next to it, so that the hook that jumped can be removed from Peg board game. The number of latches is fixed in the upper left corner of the table, and the Timer in the upper right corner counts down the time Spent. Are you ready to decipher the secret of the historical chess peg solitaire board game? Play a great challenge game consisting of 16 separate puzzles-easy, medium, hard and extremely hard: Peg Solitaire is really fun, hard game, 1 player, visually based puzzles. Logically (for young children through adults and the elderly) follow the rules of Peg Solitaire – a classic Board game similar to the concept for checkers China. The goal of the peg solitaire board game is to reduce the number of round pegs to one pile (pegs are removed when other pegs “jump” – just as you shoot the opponent’s piece in the flag) . Peg solitaire game has over 16 challenging minigames (levels) with snaps and less grid space available as you progress. peg solitaire board game is a challenging puzzle in the brain where logic and critical thinking skills are needed to find a solution. Full concentration and concentration, determination and great endurance are essential here – You really need to be ‘in the area’ to solve Peg Solitaire puzzles, especially at the following levels. . This good strategy is to spend your time and imagine a few steps forward. There is no clock pressure, so be careful planning ahead for you. Your task in peg board game is to eliminate the strategic latch until there is only one latch. Pegs are removed when they” jump ” in a similar action to catch a piece of opponent’s checkers. With your mouse or mouse pad, left click on the latch, then click on the empty square you want to move. Moving is only allowed if the jumper removes the other latch. The level is completed at the output with a latch. 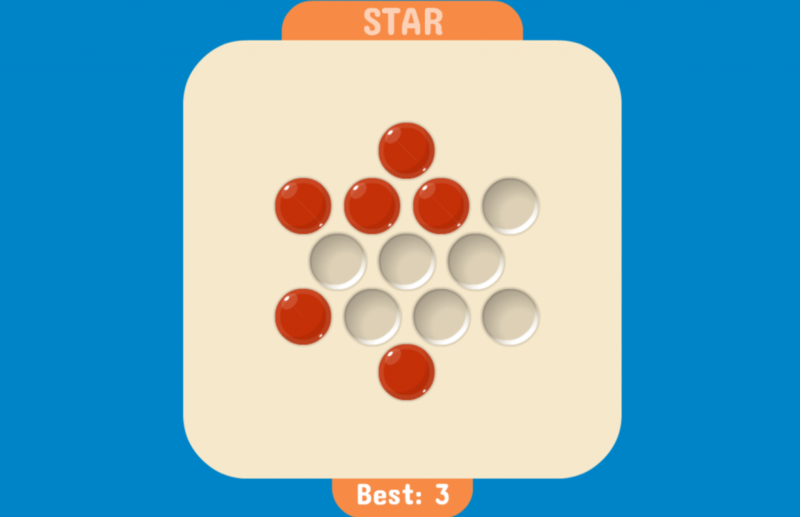 Press the back button on the right side of the play to undo the previous move. If you don’t move anymore or want to start over, press “restart”.”To try a different puzzle, click the “new game” button in the upper right corner of the Playground. Enjoy this peg solitaire game! Share the page with your family and friends. Enjoy this peg solitaire game! Share the page with your family and friends. Your task in peg board game is to eliminate the strategic latch until there is only one latch. Moving is only allowed if the jumper removes the other latch.